Acknowledged author American Psychological Association wrote Publication Manual of the American Psychological Association comprising 272 pages back in 2009. Textbook and etextbook are published under ISBN 1433805618 and 9781433805615. 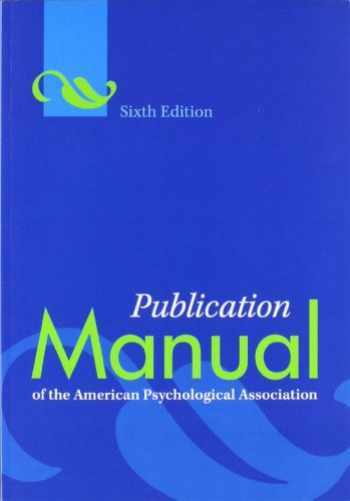 Since then Publication Manual of the American Psychological Association textbook was available to sell back to BooksRun online for the top buyback price or rent at the marketplace. The "Publication Manual" is the style manual of choice for writers, editors, students, and educators. Although it is specifically designed to help writers in the behavioral sciences and social sciences, anyone who writes non-fiction prose can benefit from its guidance. The newly-revised Sixth Edition has not only been rewritten. It has also been thoroughly rethought and reorganized, making it the most user-friendly "Publication Manual" the APA has ever produced. You will be able to find answers to your questions faster than ever before. When you need advice on how to present information, including text, data, and graphics, for publication in any type of format--such as college and university papers, professional journals, presentations for colleagues, and online publication--you will find the advice you're looking for in the "Publication Manual. "It provides invaluable guidance on all aspects of the writing process, from the ethics of authorship to the word choice that best reduces bias in language.